With unrivalled storage flexibility and native LVDS support the new VIA EPIA NR is a low profile Nano-ITX mainboard ideal for healthcare, industrial automation and digital signage systems. 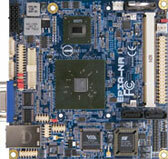 The VIA EPIA NR Nano-ITX embedded board is powered by the 1GHz VIA C7® processor, enabling convection cooled systems in locations where noiseless or dust-free systems are essential yet providing desktop performance with a maximum CPU TDP of just 9 watts and average operating power of well below 1 watt. Additionally, the VIA EPIA NR leverages the display, storage and I/O flexibility of the VIA CX700 system media processor, the all-in-one, highly integrated embedded chipset featuring the VIA UniChrome™ Pro II IGP graphics core. The VIA EPIA NR is the first Nano-ITX mainboard to natively support LVDS in two single or one dual-channel monitor configuration without the need for a daughterboard. This new Nano-ITX board also provides considerable storage options, with Serial ATA and IDE hard drive connectors for mainstream systems and Compact Flash for local OS storage in industrial automation. Moreover, an extensive I/O set includes broadband Ethernet as well as a mini-PCI port, USB2.0, COM, LPC and Super I/O headers; while WLAN connectivity can be supported through an add-in card for greater flexibility in system design.